Many of the works of ancient Greek and Hellenistic writers (including mathematicians, astronomers, and geographers) have been preserved up to the present time, or some aspects of their work and thought are still known through later references. However, achievements in these fields by earlier ancient Near Eastern civilizations, notably those in Babylonia, were forgotten for a long time. 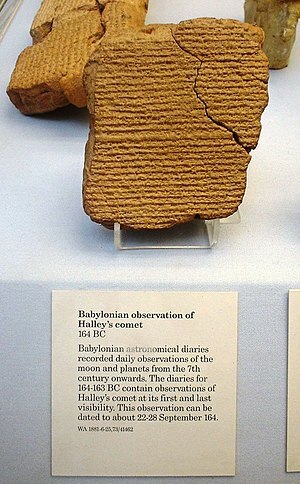 Since the discovery of key archaeological sites in the 19th century, many cuneiform writings on clay tablets have been found, some of them related to astronomy. Most known astronomical tablets have been described by Abraham Sachs and later published by Otto Neugebauer in the Astronomical Cuneiform Texts (ACT). ↑ 2.0 2.1 D. Brown (2000), Mesopotamian Planetary Astronomy-Astrology, Styx Publications, ISBN 90-5693-036-2. ↑ 7.0 7.1 Evans, James (1998). The History and Practice of Ancient Astronomy. Oxford University Press. pp. 296–7. ISBN 978-0-19-509539-5. Retrieved 2008-02-04. ↑ Lambert, W. G.; Reiner, Erica (1987). "Babylonian Planetary Omens. Part One. Enuma Anu Enlil, Tablet 63: The Venus Tablet of Ammisaduqa". Journal of the American Oriental Society. 107 (1): 93. doi:10.2307/602955. JSTOR 602955. ↑ Sarton, George (1955). "Chaldaean Astronomy of the Last Three Centuries B. C.E". Journal of the American Oriental Society. 75 (3): 166–173 [169–170]. doi:10.2307/595168. ↑ Sarton, George (1955). "Chaldaean Astronomy of the Last Three Centuries B. C.E". Journal of the American Oriental Society. 75 (3): 166–173 . doi:10.2307/595168. ↑ 23.0 23.1 van der Waerden, Bartel Leendert (1987). "The Heliocentric System in Greek, Persian and Hindu Astronomy". Annals of the New York Academy of Sciences. 500 (1): 525–545 . doi:10.1111/j.1749-6632.1987.tb37224.x. ↑ van der Waerden, Bartel Leendert (1987). "The Heliocentric System in Greek, Persian and Hindu Astronomy". Annals of the New York Academy of Sciences. 500 (1): 525–545 . doi:10.1111/j.1749-6632.1987.tb37224.x. ↑ van der Waerden, Bartel Leendert (1987). "The Heliocentric System in Greek, Persian and Hindu Astronomy". Annals of the New York Academy of Sciences. 500 (1): 525–545 [527–529]. doi:10.1111/j.1749-6632.1987.tb37224.x.